After a two-week break, the Bakersfield College wrestling team hosted the SCWA Conference Tournament where BC had five conference champions in their weight class. “It’s always good when you win matches. It was good, we had five champions,” said head coach Brett Clark. Norman Abas (125-pounder, 3-0 record for the tournament), Torrey Casper (133, 2-0), Jacob Maas (165, 2-0), Zack Mitchell (184, 2-0) and Jose Robledo (197, 2-0) were the five conference champions for BC. BC, as a team, placed third out of five colleges with a team score of 197.5. West Hills College took the tournament and the conference championship with 253.5 points. BC’s Maas received the award for the upper-weight class most valuable wrestler. Pedro Sarabia (125) of BC finished in third with a record of 3-1, and Andrew Binger (174) of BC also finished in third with a record of 3-1. BC had four fourth-place finishers with Silvestre Alfaro (141, 1-2), Armando Saldana (157, 2-2), Christian Espinoza (184, 1-2), and Jason Dibble (285, 2-2). With five conference champions and six top four placers in conference, BC looks to prepare for the Southern Regional Championships at The Brawl tournament at East L.A. College on Nov. 21. The Southern Regional Championships will be held at Mt. 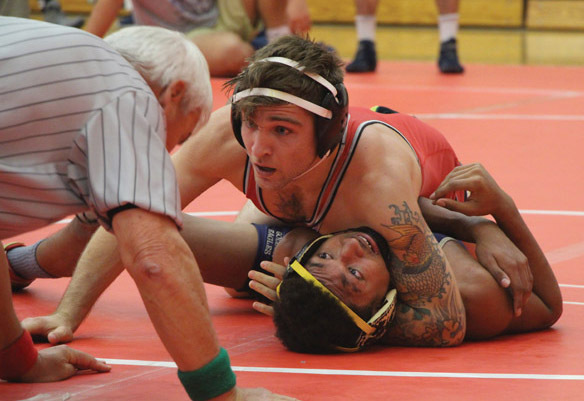 San Antonio College on Dec. 5 where wrestlers will look to push toward the state championship.